After all the adding and subtracting of talent to match the skill levels, Friday’s expected to be another exciting night of Boxing. On April 12th, 2019, beginning at 8 p.m., the Borizteca Boxing Promotions group will be back at The Big Punch Arena with another stellar line-up of bouts which will include the return of knockout artists Kevin Torres and Christian “Liger” Thomas, the former Strawweight World Champion Carina “La Reina” Moreno who might have to go the full six rounds with the unstoppable Cinthia Martinez. Mario Ramirez of Camulu is also making his return. In the Main Event it will be the 22-year-old super featherweight Roberto “The Ram” Meza (12-1, 6 KOs) coming all the way from Temecula, Calif. to take on the veteran Luis Angel “Bofo” Viedas (23-9-1, 8 KOs) of Tijuana who is coming off that unanimous decision thumping of Jesus Manuel Sandoval. 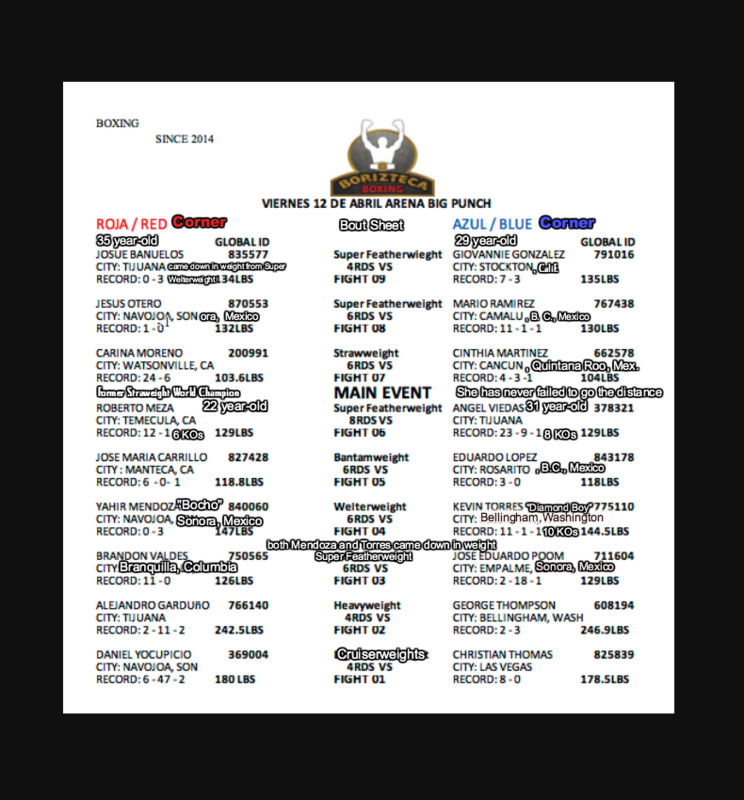 Thursday evening, April 11, 2019’s revised Bout Sheet for the Friday show at The Big Punch Arena in Tijuana. You might say it was a bit presumptious on their part, but Carina “La Reina” Moreno and her trainer/coach Richard came to town early and then spent several days traveling about our fair city as if on a holiday. Blame it on coach Noble, he’s quite a photographer. 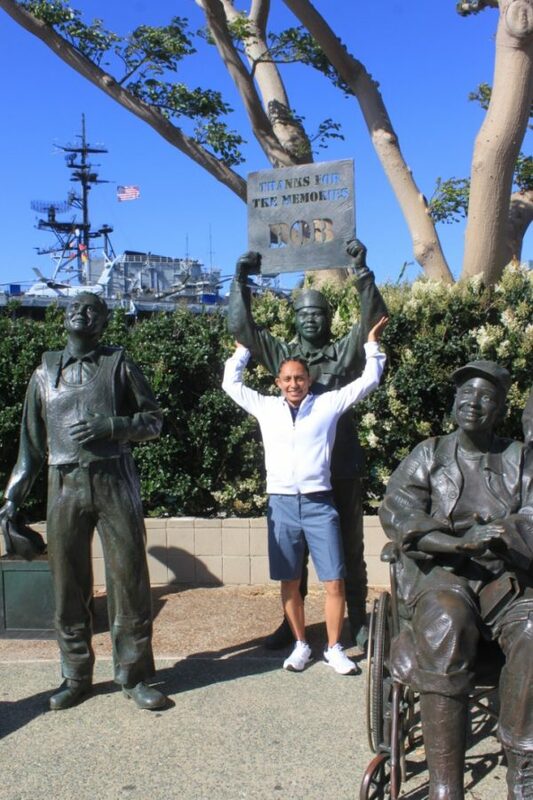 With Carina Moreno being just 5′ tall, it was great fun to have her pose in front of this iconic, nearly 100-foot statue reminding us of the sailor who kissed the nurse on V-Day in Times Square after the announcement of Germany’s surrender. 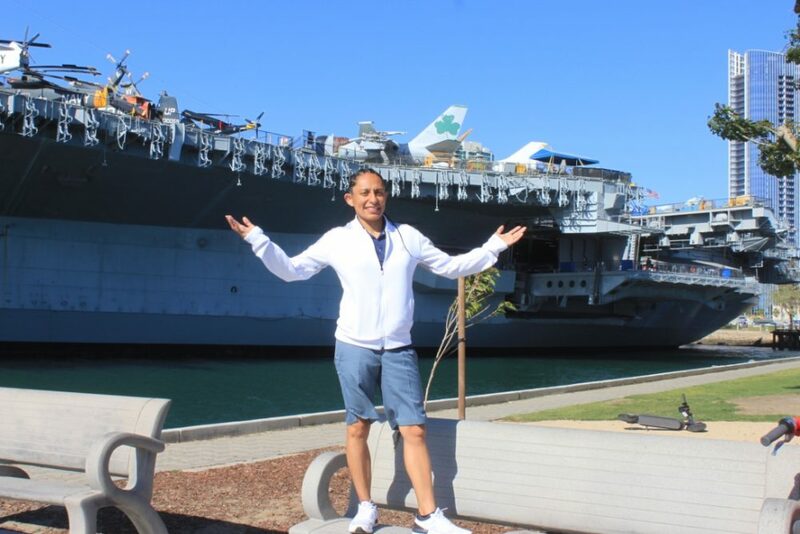 This landmark is just a stone’s throw from the even more famous USS Midway Museum. 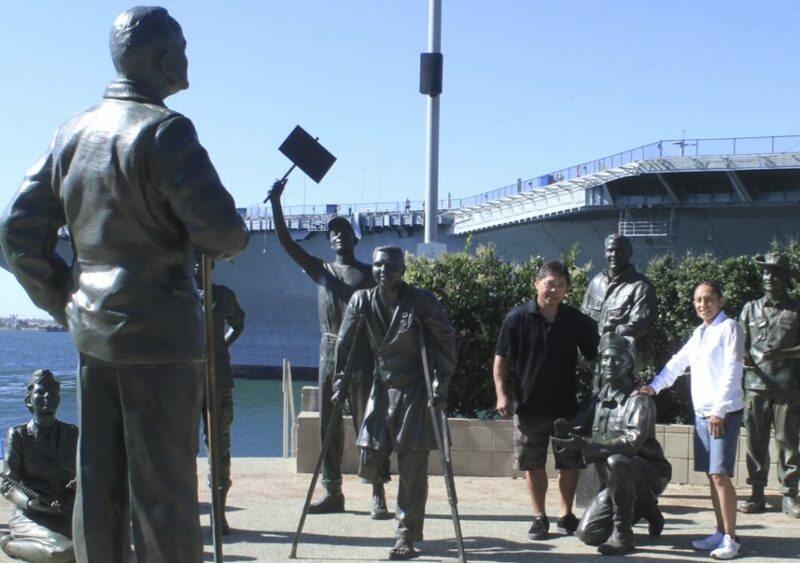 Here we have Carina and her trainer Richard Noble posing for a photo amongst the bronze statues representing the Military who attended the many Bob Hope “Road” shows that were produced by the master comedian who travelled to the troops during wartime. Always willing to help whenever and wherever she can, Carina helped this one sailor hold up his “Thanks for the memories!” sign. 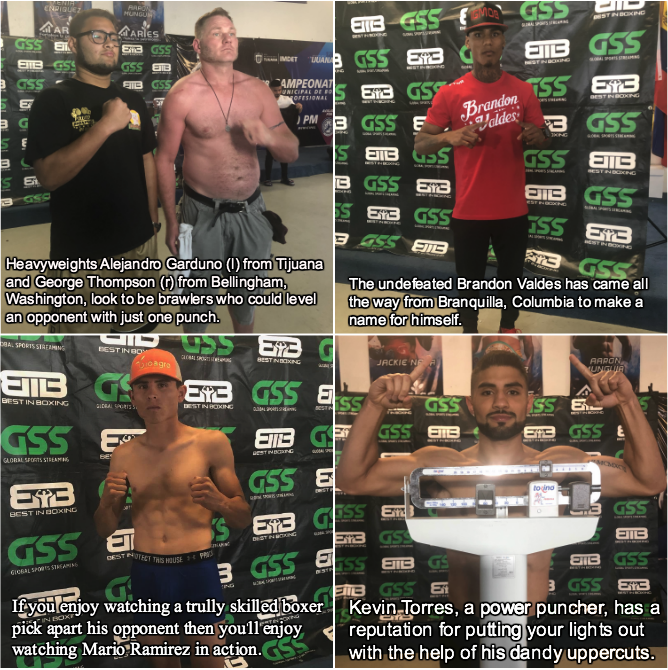 The truly interesting match-ups involve these gents – the heavyweights, Mr. Brandon Valdes from Columbia, the pure boxer Mario Ramirez and Kevin Torres who is coming down in weight. 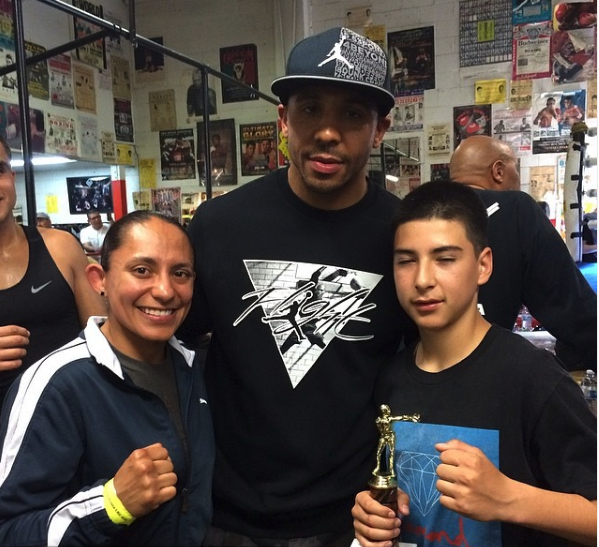 Here we see Carina Moreno with the ex-Super Middleweight champion of the World, Andre Ward plus a young man named Martin who is one of Carina’s students. The group was likely in Oakland, California at Andre Ward’s gym for a USA Amateur show. Here we see Carina Moreno being interviewed by Armando Bareno, the CEO of Global Sports Streaming and its extension Best In Boxing. They were preparing for the upcoming telecast. 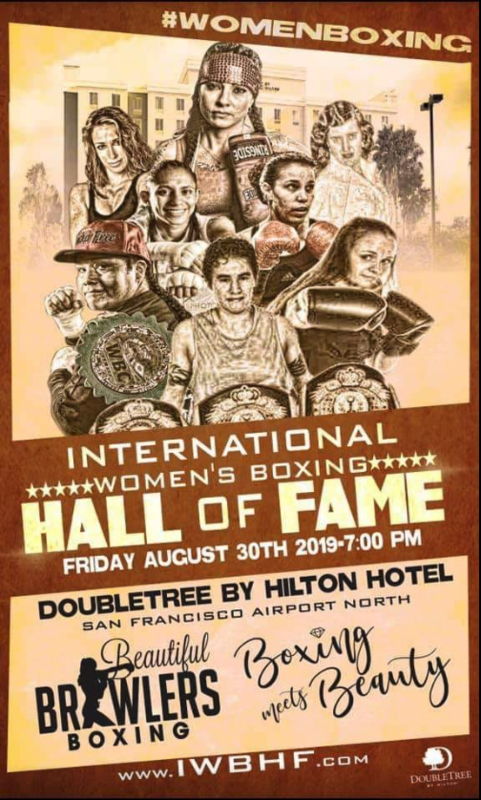 Up north in Watsonville they are known as the Beautiful Brawlers (left to right) Eliza Olson, Melissa McMorrow, Carina Moreno, Ava Knight, Martha Salazar and last but not least Blanca Gutierrez. 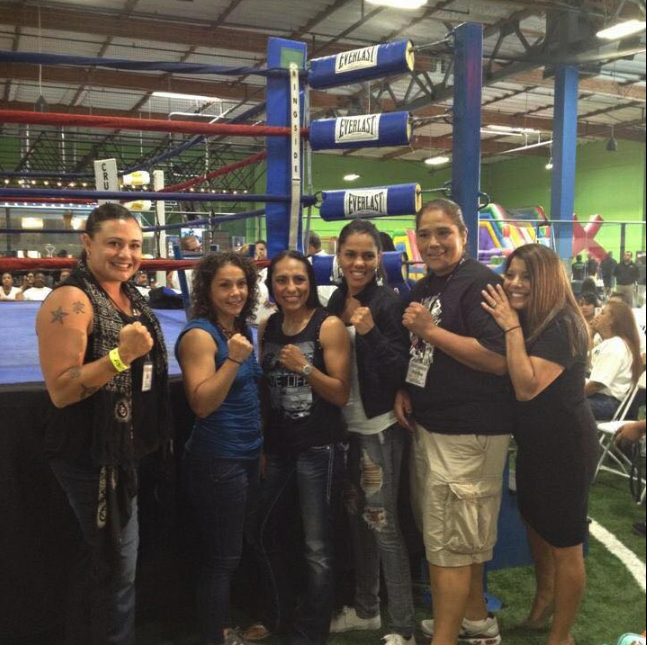 You have to admit, these ladies have one of the best teams ever as it pertains to having the necessary help with sparring to be prepared for their next fight.